Genevieve Turner’s début, Summer Chaparral, Las Morenas Book 1, is Miss Bates’ first shotgun-wedding-themed romance. Judging from the places Turner’s novel lead her to, it won’t be her last. Her impression is that a “good” shot-gun-wedding-troped romance needs a historical context where codes of family honour are paramount. (This is harder to pull off in contemporary romance, but HPs do it with sheikh and Greek billionaire romances and Orientalism be damned.) Turner’s near-turn-of-the-twentieth-century California-set romance is perfectly situated within that description. The diminished Californianos, the Spanish-originned families, are still significant landowners in a California with American statehood. The heroine’s, Catarina Moreno’s, family, is such a one, landed, Californian Hispanic gentry: they speak Spanish in their home, live with Old-World decorum, keep a Spanish kitchen, and expect their daughters, in particular, to maintain a cloistered virtue and marry into one of the equally landed and “aristocratic” long-established Hispanic families. For maximum tension and conflict, Turner places her Morenos, and their oldest and most beautiful daughter, Catarina, into a changing world: statehood and the anglo-Americans who now dominate the state. Her hero, Jace Merrill, with his own family baggage, rides into Cabrillo, looking for land and a home, “The valley had enough space to let a man breathe, while the ranges encircling it were close enough to give the impression of protecting what lay below. Freedom and comfort, all in the same place. Odd, that a landscape could be so reassuring.” The landscape is reassuring, with its green-hued chaparral beauty, but Catarina Moreno is forbidden territory. The chaparral reaches out to him, as do Catarina’s comely curves and cinnamon eyes. Though Jace carries the secret of his family’s power and hatred of Hispanics, though he doesn’t carry their name Bannister, having run away at fifteen, he yearns for connection and family. A meeting by the town trough and some stolen kisses establish his and Catarina’s attraction. He knows that the Bannisters and Morenos have ancient and nasty history. Animosity, family feud, and blood honour mix with desire, attraction, passion, and yearning for a place in the world: Jace for home and wife; Catarina, now 26, for a husband, home of her own, and freedom from her mother’s austere dominance. Jace is a hero who yearns to belong, to a home and a woman. Catarina holds out the promise of everything he hankers for, “If he settled here, took this woman to wife, he could whisper that name into the soft skin of her neck, low and sultry. At least, he could if she weren’t a Mexican. And he weren’t a Bannister. He was already playing with fire, considering how protective Mexican fathers were of their daughters.” He reaches out for her, with kisses and flirtatious conversations and “chance” meetings, even though he knows their union would result in a Capulet-and-Montague, Hatfield-and-McCoys break out of feuding families. The call of bodily desire is strong and Catarina and Jace are caught in a compromising position by Senor Moreno. He demands that Jace marry his compromised daughter and the Moreno women go into wedding plan mode. Jace and Catarina are torn about it: they want to be married with a family and place of their own, but they don’t know, or trust each other fully, nor hear love’s call … yet. The one out of honour and the other out of duty to her family determine to make the best of this situation. Of course, there’s also the fulfillment of that burning attraction to look forward to. Miss Bates thought that the novel’s initial chapters were uncertain and unconvincing. Turner tried to balance introducing Catarina’s extended clan, especially her fascinating mother, silent father, and sundry siblings, and various secondary townspeople, while establishing the basis of the romance and conflict between Jace and Catarina. The romance suffered, Miss Bates thought, and, as a result, the conflict did too. The protagonists’ over-wrought sentiments didn’t match their under-developped “courtship”; Jace and Catarina’s sentiments rang hollow. They protested too much. Their reasons for staying away from each other were stolid, but their reasons for being together were based solely on physical attraction. The rest of the week was more of the same, a strange dance between them where for a few moments they would be in perfect step, flowing together, and then suddenly one of them would step on the other’s foot and it would come to a stuttering, stumbling halt. This getting along together wasn’t something she’d thought of beforehand, but it seemed it was the hardest part of being married. Miss Bates thought the dance metaphor, its rhythm and missteps, fits and starts, the perfect description to the misunderstanding and mistrust that simply not-knowing-each-other-well can lead to in a marriage. And the hurt. Does Turner ever do a great job at the hurt that married couples inflict before they learn compassion, humour, and forgiveness. Jace proves hurtful and needy; Catarina proves angry, imperious, and cold. Miss Bates loved Turner’s portrait of Catarina’s waspish anger, righteous as it was, “She felt something inside her snap, as if she had gathered up everything about her marriage and broken it over her knee like a twig.” Frissons of discovering a great romance writer. Because Turner turned that twig into a blossom, fresh and delicate and aromatic, and supple enough to bend and forgive and show potential for growing strong, for flourishing. As do her prickly, needy, loveable protagonists, Jace and Catarina Moreno-Bannister. After the first dozen chapters, Miss Bates was utterly immersed and fascinated by Summer Chaparral and found in it evidence of “a mind lively and at ease,” Emma. Miss B. can’t wait to read the second book in Turner’s Las Morenas series, Autumn Sage. 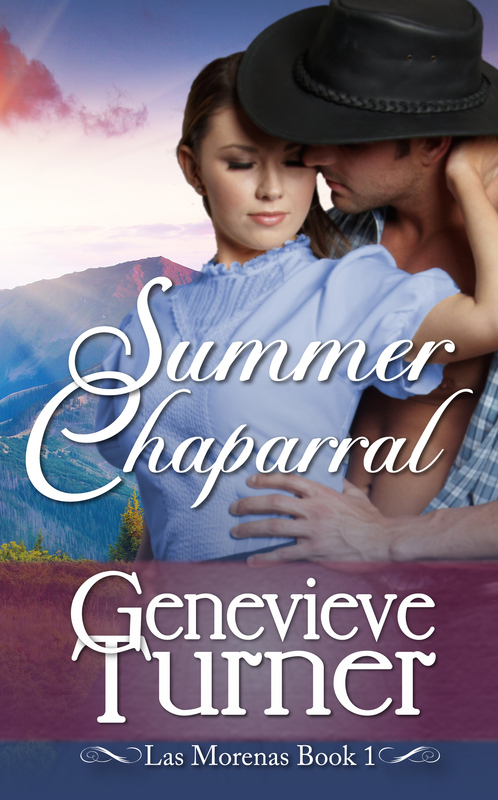 Genevieve Turner’s Summer Chaparral is self-published and has been available in e-format at your favourite vendors since October 5th of last year. Miss Bates received an e-ARC on Netgalley.